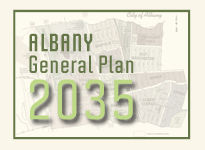 On February 26, 2016, the City of Albany published a proposed Addendum to the Public Review Draft General Plan. The Addendum includes 24 pages of proposed line edits to the Draft Plan which respond to comments received on the document since its release on November 25, 2015. Comments were received from City Commissions, the City Council, agencies, organizations, and individuals. The edits incorporate appropriate revisions, while maintaining internal consistency and compliance with State General Plan Guidelines. Many–but not all–of the comments made led to revisions. The City has also published the documents that will comprise the Final Environmental Impact Report (FEIR) on the General Plan. These documents include the “Response to Comments,” “Mitigation Monitoring and Reporting Program,” and “CEQA Required Findings” The Response to Comments includes copies of all letters and oral testimony specifically on the Environmental Impact Report, and responses to those comments. Copies of the Addendum and FEIR materials may be accessed via the Documents link on this website, or via the hyperlinks above.